Physical activity is part of any healthy pregnancy. Whether you just walk a lot, cycle to work, or attend special prenatal classes, many types of exercises contribute to the overall health of you and your baby. But, is it a good idea to use your exercise routine as part of a plan to limit pregnancy weight gain? Exercise, or just physical activity of any kind either specifically intended as working out, or just totally random has many benefits. They include feeling fitter, being stronger and having better endurance, and feeling happier (yes, really). In some cases, exercising can also be an integral part of a weight loss plan. 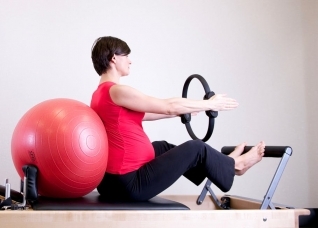 Exercise should always be included in a strategy of weight loss after pregnancy, for instance. But, when you are pregnant, exercising should be for overall health and fitness, getting fresh air (if you exercise outdoors) and feeling better. You should not limit weight gain specifically by exercising. That doesn't, of course, mean that it is a great idea to sit around your house your whole pregnancy, and to be a couch potato. Healthy pregnancy weight gain will happen if you eat the right amount of calories and are regularly physically active. We spend so much time looking at the risks of pregnancy obesity and gaining too much weight while expecting a baby, that we might forget that weight gain is a perfectly healthy and normal part of those nine months. Living normally and healthily is the best goal for any pregnant woman. Remember actually losing weight is nearly never a healthy approach in pregnancy. If you have any doubts about what is healthy an what is not when it comes to prenatal exercises and physical activity, we recommend you discuss this with your gynecologist. Midwives, nutritionists, and personal trainers can also be of help when you have a specific question. Do you need to be fit to have an easy birth?